This TV Stand Holds a Big LCD Screen and Camera for Video Conferencing! This Plasma Mount Has Many Deluxe Features for Storing the Different Presentation Accessories! This TV Stand with Black Door Ships Quickly! Bracket features universal VESA mounting patterns. Cord managing system organizes the various wires. Mount accommodates 80" screens that are less than 400 pounds. This TV stand designed for boardrooms has plenty of space for holding all the deluxe presentation aids. 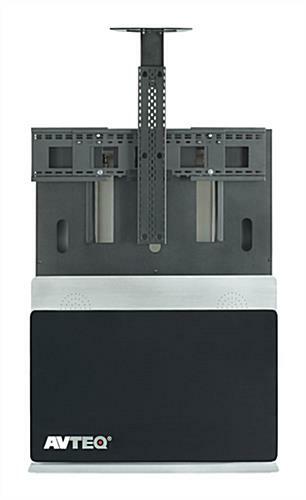 The black tempered glass cabinet door slides open for access to the rack mount storage space. 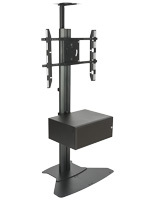 This TV stand, frequently called an LCD screen holder, offer 10 rack units in the cabinetry. 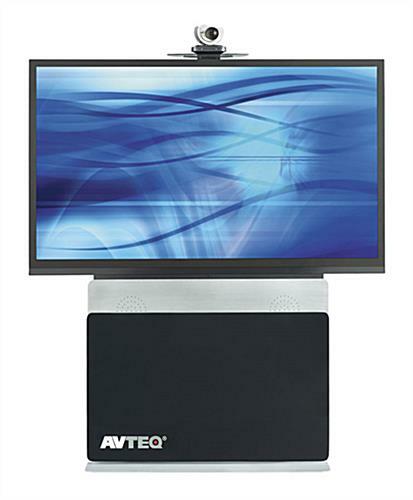 The video conferencing workstation has an adjustable camera shelf for adapting to the viewing needs of the audience. This TV stand for the office, frequently called an LCD screen display, comes with internal cable management for organizing the different wires. The silver and black coloring of the office furniture is very attractive and will match the decor. This TV stand for video conferencing uses VESA mounting patterns to conveniently attach screens from major manufacturers. The included surge protector offers six ports for electronic applications. 43.0" x 58.5" x 11.5"